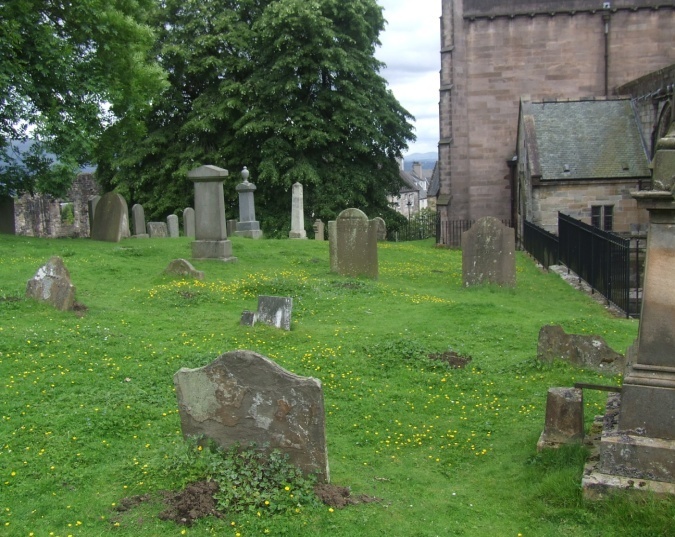 Although, as this website shows, there were other burial sites in Stirling, the area around the church was the main burial place until the 1850s. The gravestones are in rows and burials lie facing the east –ready for resurrection at the Last Trump. 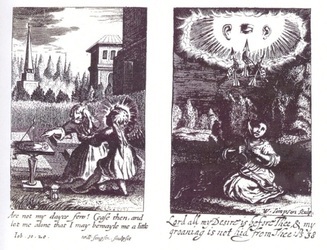 The area on the north side of the church was unfashionable; poorer people were buried here and did not have gravestones. From the late sixteenth century gravestones in the kirk-yard became fashionable. 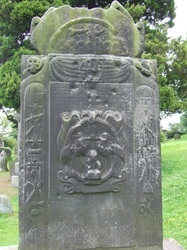 The oldest stone identified has the date 1579. 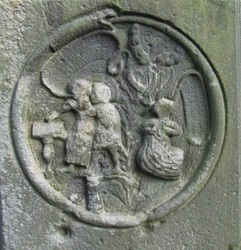 It is a flat slab and was for a stonemason called Gibb who is surrounded by burials of later members of the Gibb family. The Service stone was set up about 1636 by John Service to commemorate his father and uses motifs from Quarles’ book Emblems published just a year or so earlier. The ‘speech balloons’ contain the captions from the book. from sniper fire when Stirling Castle was besieged in 1651.